Probably the most regular and common posts will be about weird, eccentric, terrible, abrasive and unconventional bands or artists of which you may not yet have heard. This is where we will be looking at what songs/artists have been banned from TV, radio, live gigs and any other place by censors, the government and any other authoritative bodies. Sometimes a new interpretation of an old song can be a breath of fresh air. We’re scouring the internet for the opposite. 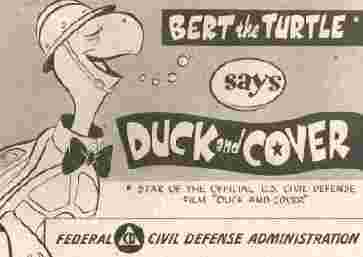 When we post something in this category just remember the friendly turtle from the cartoon and ‘duck & cover’. Here we’ll deal with music that explicitly endorses and pushes a political agenda and is made with the sole intention of influencing people. We’ll range from Nazi Swing Jazz to pro-American WWII anti-Germany folk and will include any state-endorsed/produced music, such as the Korean pop music that is transmitted into civilians’ homes through a radio perpetually fixed on a government-approved station. As the terrible pun in the title suggests, here we deal with the lamest in religious music, music by religious nuts or pastors preaching to their parish. From time to time when something interesting comes up we will post about news in the experimental/anti-easy listening Ear Vomit musical universe. We’ll be uploading our playlist for each episode of our radio show which you can hear broadcast in Australia on SYN 90.7FM (or online via www.syn.org.au for international readers) Sunday nights from 11pm. I’ve got something in mind for Sunday, don’t you worry.